Robo-Rooter is my latest combat robot. It is a 3lb horizontal disk spinner. Over the summer a friend was selling some of his unused combat robot parts and I bought one of his hubmotor disks from one of his old robots. I bought the disk before I had any real plans for building a robot to use it. I originally wanted to do a vertical spinner like the robot it used to be in, but with the disk at 6" dia the robot would have had to be comically large to have any stability. I thought about it some more and decided to do a horizontal spinner. After looking at manyotherhorizontalspinners i settled on the fairly generic design that many horizontal spinners share. Which is a semi triangular shape with weapon at the front and wheels at the back. Now that I had the weapon and general design of the robot I could begin work on designing everything else. I first determined what components I wanted to use. I went with two Fingertech TinyESC's and 1000rpm motors with 2 1/4" wheels for drive because the combination is fast enough for a weaponed robot. I decided to run the robot at 3s or 11.1 v because I already had 3s lipo batteries and a charger left over from another project. To actually design the robot I used Autodesk Inventor. I first modeled out the area needed by each robot component and then figured out how small I could make the robot and still fit everything. The other challenge was keeping it under weight. Designing it in a CAD program made everything easier than the other design method I use which is to physically lay out each component and then draw an outline on cardboard. I also don't have any pictures of wiring the robot because soldering requires two hands and my camera can't levitate. Robo-Rooter will be competing in the 3lb weight class at North East Robotics Club's event at the Motorama Carshow Febuary 16-17th in Harrisburg PA. More info about how the robot did will be added to this Instructable post event. Combots/Robogames The largest events on the West Coast. They run weight classes from 1lb all the way up to 220lbs. 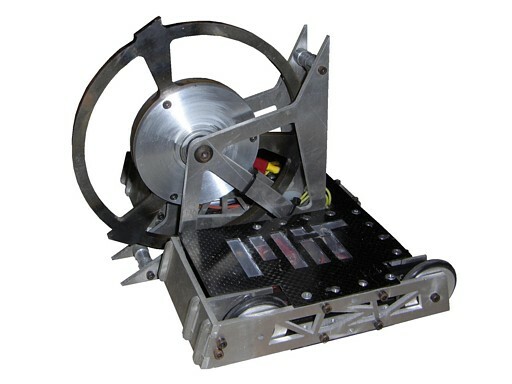 FingerTech Robotics for 1-3lb robot parts and an awesome 1lb bot kit. I am planning on building a combat robot and I really like your design. If you are able to send me the CAD files I would really appreciate it. My team and I are planning to build a robot similar to this. Could you please upload the CAD files? If willing or know where I could get one made or a kit to build it with all parts that would rock. I'm curious to see how the 1/16" Ti holds up when the disc gets hit by a high KE vertical spinner. With the shaft mounted so far out it might tear out of the Ti. Also, is that a dead shaft setup where the main part of the hubmotor spins too adding to the moment of inertia? If it is that's a great idea and an excellent way to get more out of the weight of the motor. Getting beat up so badly, how long do the bearings in the evil spin thing last? Who did you use for water jetting service? thanks! I saw a version of this at the Dragon Con Robot Battles several years ago. I'm pretty sure the thing did so well in the light weights division that they even jumped into the heavy weights Free For All and won! I think I even have a video of it somewhere on my home computer. yeah, the design for both machines is fairly generic and common.